This manuscript gathers together several devotional and moralising writings, in Latin, English, and French. It was probably made for churchmen at the Cathedral, Norwich. It may have been useful to them in composing sermons and teaching as well as for as an aid to personal prayer or a worthy pastime. One of the works is a copy in Latin of a medieval best-seller, 'St Patrick's Purgatory,' which is a story about a well-like cave, identified as Lake Derg or the Red Lake, through which Christ had led the miracle-working monk St Patrick into the underworld. The action continues centuries later with the visit of a knight named Owein to the lake and his experiences of Purgatory. The story exists in several versions, the oldest in Latin, but many translations and versions of it were written in Old French, most famously by Marie de France, Provencal, Anglo-Norman French, English and Spanish, through the late middle ages and into the period of the Reformation. 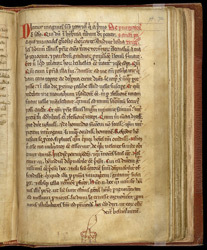 Owein's descent into Purgatory was recorded by Matthew Paris in his 'Chronica maiora' as taking place in the year 1153.